The focus of the new Doom has very much been multiplayer, with single player reveals largely confined to some streamed gameplay and a leaked trailer. 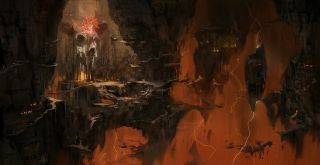 This new art however gives a little bit more of a look at the locations in the game (including a return for Doom 2's Icon of Sin) and expands on the story behind them. It's not a huge amount of detail but it adds some flesh to the bones of the main campaign. "This was an early pass on the facility that ultimately became Lazarus. In this instance, it was hidden in a volcanic crater. It would only become visible once you made your way over the crater’s edge before entering the level. This was also an early pass on what the cleaner, scientific building style would look like from an exterior view". "This was an early take on a room in Lazarus where you could find evidence of the UAC experimenting on an unfortunate Mancubus. In rooms like these, we would also see the early steps the UAC was taking to make cyber versions out of various demons. You can find a room similar to this in the final game, surgery bot included". "This concept was to help establish the exterior architectural theme and lighting of Resource Ops. The idea here was to make the first view the player had upon entering this area a sweet vista and a view of their goal. In this case, their intended goal was the tower you can see through the V shaped support". "In our fiction, Lazarus thematically represents the intersection point between science and mysticism; the point where UAC scientists discover Hell and inevitably become corrupted by its influence. In terms of player progression, the architecture of Lazarus was originally designed as a vertical descent, progressively leading the player downwards towards the Hell portal at the base of the facility". "This is an early concept for the interior of Argent Tower. The tower serves as one of the UAC’s key experiments into interdimensional research and exploration". "The look of Res Ops is partially influenced by modern oil rigs. We wanted to hint at the idea that the mining operation on Mars is huge; that there’s a large network of these types of platforms, where the workers essentially work and live entirely subterranean lives". "This is a color and lighting pass over game geometry to establish the mood of Hell. Prior to this, a few early mood paintings were done with color palettes inspired by the work of Zdzisław Beksiński. This particular image was one of a dozen passes with subtle variations. The goal was to give the player an uncomfortable and unpleasant sense about the place. Unpleasant to the point you could almost smell the sulfur as you entered the level". "This was an early exploration for the Necropolis, which was described to me as a cavernous ruin with a bottomless pit and precarious walkways, which were inspired by the precarious mountain paths of Tianmen Mountain. I added a giant demon skull as the centerpiece as a throwback to the Icon of Sin and it stuck all the way to the end of production". "It was really fun to redesign something that was so iconic (no pun intended) from DOOM II. We tried to keep as much of the spirit of the original, making it recognizable while putting our own spin on him. Here he lies dormant in the heart of the Necropolis, waiting for the opportune time to rise again".